The 2017 tournament at a glance. Laura Siegemund has done it again. Like in 2016, the local hero will once again contest the final of the 40th Porsche Tennis Grand Prix. Her semi-final win against the Romanian Simona Halep means she will now face Kristina Mladenovic on Sunday. The Frenchwoman defeated Maria Sharapova in a high-class three-setter to end the world star’s impressive comeback. With a capacity 4,600 crowd watching on, the Porsche Arena was filled to the rafters for the semi-finals. Kristina Mladenovic has already amassed 21 wins on the WTA Tour this year and also won her very first career tournament in St. Petersburg in February. In Stuttgart, she is one step away from her biggest success. In the penultimate round of the Porsche Tennis Grand Prix, last year’s doubles winner downed Maria Sharapova 3-6, 7-5, 6-4 in a match that lasted two hours 38 minutes. It meant that the Russian’s impressive winning run upon her return to competitive tennis in the Porsche Arena was over. The 29-year old Stuttgarter Laura Siegemund once again showed that she is a force to be reckoned with on her home patch. One year ago, she stormed all the way from qualifying to the final. Pumped up by her fighting spirit and the crowd’s ecstatic support, she again powered her way to the match that will decide the destiny of the winner’s car with a victory over Simona Halep, the world No. 5. She impressed throughout with her aggressive game and quick and unflagging legs that have been put to the test in some very long matches this week. Her quarterfinal against Karolina Pliskova was even the longest match – 3 hrs 9 mins – of the of the tournament. Today’s semi-final against the Romanian lasted 1 hour 43 minutes. The opening match on Sunday will see Raquel Atawo (USA) and Jelena Ostapenko (LAT) take on Abigail Spears (USA) and Katarina Srebotnik (SLO) in the doubles final. The capacity crowd in the Porsche Arena was treated to top class tennis in the quar-terfinals of the Porsche Tennis Grand Prix. Maria Sharapova continued her successful comeback with another win and advanced to the semi-finals after beating the impres-sive qualifier Anett Kontaveit from Estonia 6-3, 6-4. She has been joined in the penul-timate round by Laura Siegemund. The local hero and member of Porsche Team Germany defeated the Czech Karolina Pliskova 7-6, 5-7, 6-3 in the best match of the tournament to date. Lasting three hours ten minutes, it was also the longest. In her attempt to reach her fourth final in Stuttgart, Maria Sharapova will face Frenchwoman Kristina Mladenovic on Saturday. Laura Siegemund’s opponent is the Romanian Simona Halep. Maria Sharapova’s return has been the subject of much discussion over the past few days at the Porsche Tennis Grand Prix. Laura Siegemund’s comeback in the first set of her quarterfinal encounter with Karolina Pliskova was also a major talking point – the world No. 3 was 5-2 and set point up but the Stuttgart-resident dug deep and ran down every ball. She fended off the first set point and then another to force a tie-break which she won 7-3 in front of the ecstatic audience. Though she lost a tight second set she continued in the zone and eventually had three match points after three hours ten minutes. Last year’s runner-up promptly wrapped up the match with her first chance. The Porsche Arena was quaking. Whilst the tournament is already over for the title-holder Angelique Kerber from Porsche Team Germany, her teammate Laura Siegemund from Stuttgart has progressed comfortably to the quarterfinals. Maria Sharapova (Russia) also advanced to the last eight. The sell-out crowd in the Porsche Arena gave Maria Sharapova a rousing welcome and were party to the eagerly-awaited comeback. It turned out a return that they would have wished for the three-time Stuttgart winner. In her first match on the WTA Tour after a 15-month break, Maria Sharapova overcame the strong Italian 7-5, 6-3 to reach the last 16 at the long-standing tournament which is being played for the 40th time this year. The first player in the quarterfinal of the Porsche Tennis Grand Prix is Simona Halep. Also in the last eight is the Estonian qualifier Anett Kontaveit. One player to win her first ever main draw match in the Porsche Arena was Johanna Konta from Great Britain. Title-holder Angelique Kerber’s first opponent at the anniversary tournament is now known – the world No. 2 will meet the strong Frenchwoman Kristina Mladenovic, who won her opening match in a surprisingly easy fashion against the Indian Wells winner Elena Vesnina from Russia. CoCo Vandeweghe enjoyed a successful debut at the Porsche Tennis Grand Prix. The American had to dig deep when narrowly overcoming the qualifier Jelena Ostapenko (Lithuania) 7-6, 7-6. For German Tamara Korpatsch, the only other domestic player in the main draw alongside Angelique Kerber and Laura Siegemund, her premiere at the Porsche Tennis Grand Prix came to an end in the day’s first match. Laura Siegemund feels at home at the Porsche Tennis Grand Prix – and that in more ways than one. 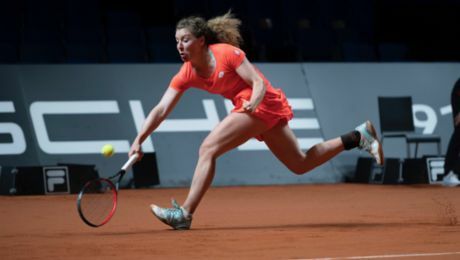 On the one hand, the 29-year old Porsche Team Germany player lives in Stuttgart and, on the other, she celebrated her biggest success to date in the Porsche Arena in 2016. In winning seven times last year, the local hero stormed her way from qualifying to the final. On Tuesday, she safely negotiated the first hurdle at the anniversary tournament. Tenacious and full of energy, Siegemund beat Shuai Zhang from China, 6-2, 7-6. The audience in the sold-out Porsche Arena saw a gala featuring elements from classical music and vocals, pop and ballet, stunning artistic performances and surprising pyrotechnics. Alongside Angelique Kerber and Laura Siegemund, Tamara Korpatsch is the third German in the Porsche Tennis Grand Prix main draw. Also in the main draw is Jelena Ostapenko from Latvia. Another player to claim a place in the tournament proper is the Japanese Naomi Osaka after her 7-5, 6-2 win against Katharina Hobgarski from Porsche Talent Team Germany. Anett Kon-taveit (Estonia) has also secured herself a berth in the 28-player field after beating the Czech Lucie Hradecka 6-3, 6-7, 6-1 in her final qualifying match. Completing the tour-nament line-up is lucky loser Jennifer Brady after Dominika Cibulkova, the 2016 WTA Finals winner, was forced to withdraw with a wrist injury. Her place in the seedings has now been taken by the Spaniard Garbine Muguruza. In the doubles, Laura Siegemund from Porsche Team Germany and her partner Asia Muhammad from USA have reached the second round. With Germany 2-0 up going into the second day of the Fed Cup tie, Angelique Kerber lost the opening showdown between the two top players 6-4, 6-2. It was her fourth defeat in a row against the world No. 13. The result duly increased the pressure on Julia Görges in the second singles against Lesia Tsurenko. Görges, who on Saturday performed excellently to beat Svitolina in a three-setter, began nervously and was quickly behind 4-1. The world No. 46 then found her form to reel off five games in succession and with it the set 6-4. Things went much the same way in the second set – Görges lost the first three games before getting back on track to win the match 6-4, 6-4. It meant that Porsche Team Germany were 3-1 up and could not be caught going into the doubles. They are also certain of a place in the Fed Cup World Group in 2018. There were also exciting matches on Sunday in the second round of qualifying at the Porsche Tennis Grand Prix. Katharina Hobgarski, a member of Porsche Talent Team Germany, has progressed to the third round. Also one step away from a main draw berth is compatriot Tamara Korpatsch. The opening day of the 40th Porsche Tennis Grand Prix served up numerous highlights – the drawing of the main draw for the long-standing Stuttgart tournament produced a whole host of exciting encounters, and the spectators were treated to thrilling first round encounters in qualifying in which five German players have progressed to the next stage. Not to forget – in the Fed Cup World Group play-off taking place parallel to the start of the tournament, Porsche Team Germany went 2-0 up against Ukraine. Porsche Team Germany now only needs a single point from a possible three matches on Sunday to retain their place in the World Group in 2018. The draw for the first round of the tournament proper has handed the title-holder a tough opening match – Angelique Kerber will face the winner of the duel between the Frenchwoman Kristina Mladenovic and Mirjana Lucic-Baroni from Croatia. “The draw has not been kind to Angie,” commented Anke Huber, the Operating Tournament Director of the Porsche Tennis Grand Prix. Laura Siegemund, the second German in the main draw, will face Shuai Zhang in the first round. The Stuttgart resident won her only previous match against the Chinese at the 2016 Olympic Games in Rio. “On clay, the draw is doable for Laura,” said Anke Huber. A review of the tournament.